Decorating sugar cookies was always a fun holiday family tradition growing up and I especially loved making Halloween sugar cookies (my birthday is just before Halloween and it is one of my favorite holidays!) I loved to decorate them. All of my siblings were long gone while I was painstakingly lining up sprinkles in a pattern or something equally time-intensive. I just loved to decorate and was pretty serious about it. Fast forward to now and I’m a busy mom, three kids, my own business there is just not enough time in the day especially to make a pretty sugar cookie. So one day a few years ago I was making cookies for Halloween and was about to get decorating like I always did with a knife and some sprinkles when I thought there had to be a faster way. So this is what I came up with using my favorite sugar cookie recipe. Combined with the equally tasty frosting and they taste like a better version of those soft sugar cookies you get in the bakery section. SOOOOO good. 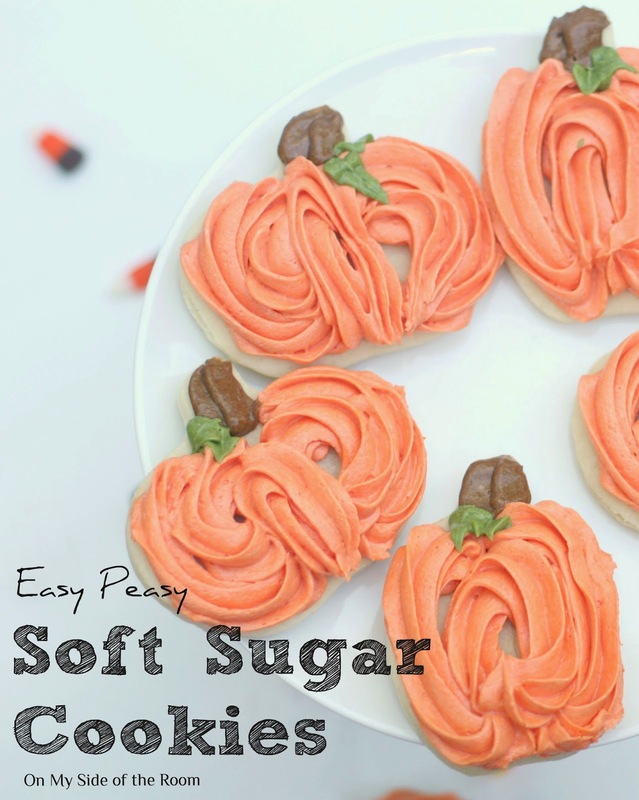 To make these Halloween sugar cookies you first you start off with the sugar cookie recipe. The dough will be crumbly, so knead it together with your hands as you scoop it out of the bowl for rolling. Divide the dough into 4 sections. and bake for 10-12 minutes. Let sit a few minutes on the sheet, then transfer to a cooling rack. Now it’s time to decorate! Of course, you can do whatever way works best but these are so fast to decorate you can make up a bunch in no time. With your 1M tip with orange frosting and start on one side top to bottom around the edge. Then the other side. Afterwards another time on each side in the middle. After that’s done you’re going to make an oval for the middle starting at the bottom going up and then back to the bottom again. Then it’s time for the stem, super easy, just two lines with your 104 tip. And then your leaf with your 67 leaf tip. I did two leaves but you can do whatever you’d like. You can also add small vines with your 1 tip. Then they are ready to go! Perfect Halloween sugar cookies or thanksgiving, or just for fun cookies! These are beautiful! Thank you for posting detailed step by step shots! Thank you! They are seriously the best sugar cookie recipe around that I’ve found! For an un-crafty person like myself, I appreciate your step-by-step photos. I used to do step-by-step cooking photos and I know how time consuming that can be. These cookies are so cute! Thank you for sharing with See Ya in the Gumbo this week.